Our large filter basket allows a high ratio of coffee grounds to water to make a strong concentrate. The silicone seal allows you to shake the jar during the brewing process ensuring that all of the grounds are completely wetted. Our jar is a Ball 2 quart mason jar made from durable soda lime glass. The filter is made from heavy gage, food grade stainless steel wire that will not bend or dent. The 2 quart jar will yield up to 1.5 quarts of coffee concentrate. Because we use a standard mason jar, you can add your own jar to the system to brew one batch while drinking another. This system can also be used to make cold brew tea or sun tea with loose leaf teas and infuse water with fruits or oils with spices. You will enjoy our high quality, stainless steel filter. Our filter mesh is super fine to prevent grounds from entering the coffee. The heavy duty mesh in our filters will last a lifetime. Our rolled and folded seam eliminates any sharp edges. High quality, durable flip cap lid. The flip cap lid allows you to brew, pour and store your coffee with ease! The cap lips open and stays open to allow you to pour out your brew. The high quality seal means you will never have a leak! Ball mason jars are made to last and built to withstand the canning process. There is no need to worry about breaking your jar, this heavy duty jar can withstand rough handling. The inert soda lime glass also won't leach harmful chemicals into your brew. You can also cold brew tea and our brewer makes a great infuser too! Infuse water with your favorite fruits or infuse oils with spices or other flavorings! 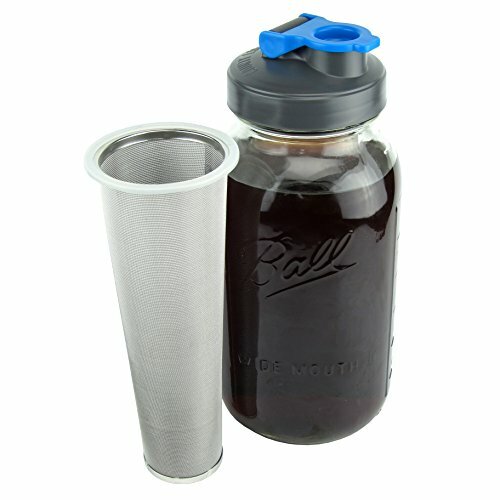 Our brewer's components are all made BPA free and made of food grade, FDA compliant glass, stainless steel and plastic.